For years I believed Kate Bush's music held a particular mystical, occultish, mythical, almost religious quality for me, due to the circumstances in which I was introduced to her music. As my friend M_____and I were driving around, we happened to approach Penwell-Gable Funeral Home. From a distance, it looked like a party; gathered in the parking lot were kids smoking and drinking, dressed in black, with spiky Mohawks, combat boots, motorcycle jackets. Getting closer, we recognized some friends, and realized there were also conservatively dressed adults entering the building too. "Oh, it's J_____'s funeral…," M_____ figured. A girl we knew in passing, had just died in a car accident. We parked, mingled with our punk rockin' friends, and mindlessly headed in to the funeral home. J_____'s body was there, in a casket. Although I'd been to funerals before, I'd never been to a wake, or an open casket service. The last time I'd seen this girl, just days before, she was dancing and accidentally bumped a tray I was carrying, as I was descending stairs at a club. So sweet, she smiled, leaning close to me, putting her kohl-lined eyes, and blood red lips close and apologized profusely, over the loud music. Now, she was lying in the casket, dressed in lavender and frills, hair neatly combed, no trace of the punk rock girl that said, "sorry." Standing there over the casket, I was shocked, and I can barely begin to describe the effect of this shock had, and to some degree, still has on me. 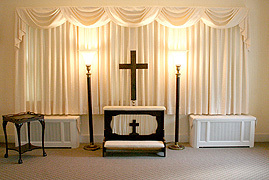 The reality of death, the body as a husk, the cheap, heavenly aesthetics used in contemporary death-related events (such as the décor of funeral homes) all point to issues with ‘Façade,' meaning/meaningless, real/unreal. Over the years, I've realized these dynamics, rather than the easy and dismissive "fear of death," are probably more at the heart of my real issues. Back to Kate Bush. After M_____ and I left Penwell-Gable Funeral Home, we went to a club we frequented with friends. It was still early, and noticing we were a bit down, the DJ put on some new music he thought we'd like, Kate Bush's Runnin' up that Hill. I couldn't believe my ears—I loved it. Of course, I have always associated that song and her voice with all the morbid dynamics of that day. Throughout years of listening to, and hearing others talk about their own experiences with Kate Bush's music, I began to realize there is quite a mystical, occult, and deeply psychological element in her music, and my association of it with such things was far from unique. When reading critiques and discography literature regarding the themes and lyrics of Kate Bush's music, the literary references of her work are usually acknowledged. While it's true many of her songs and lyrics are based in classic literature, most of (if not all) of those have a unifying occult theme. For example, in Wuthering Heights, the narrative is that of the ghost, Catherine. Infant Kiss is based on Henry James's Turn of the Screw, a classic ghost story. The song The Sensual World is based on Molly Bloom's soliloquy, from James Joyce's Ulysses, a Trickster-like work filled with esoteric notions and references. Get out of my House is based on the film The Shining. Hounds of Love is based on the film 1950s B-movie Night of the Demon. The more difficult task might be finding a literary tie to Kate Bush's music and lyrics that is not based in some manner of occult. There are also many other songs based in occultism. Cloudbusting tells the story of William Reich in his Organon days, while Them Heavy People addresses G.I. Gurdjieff. There are so many others, Waking the Witch, Experiment IV, Hammer Horror, The Red Shoes, Houdini, etc. Naming all the songs with occult references is akin to a full discography. Could the mythology, mysticism, and meaning account for her across-the-board fanship? Kate Bush has fans in all age groups, and a across all genre bases. Also, Kate Bush has some aspects of a Trickster persona. Not only is her music itself fairly unclassifiable, she plays with that notion herself. In her videos, she takes on issues of identity which create a sense of gender and sexual liminality, a Trickster quality. For example, in the Cloudbusting video, she plays William Reich's young son, the narrator of the song-- the last line is "your son's coming out." In one of the Runnin' up that Hill videos, Kate and her male companion find themselves in a crowd of their (masked) dopplegangers. The song itself is about attempting to experience and gain perspective from the opposite gender. Kate Bush's notorious privacy has also fueled rumors and mysteries. I recall a rumor of a bout with leukemia—a rumor which may have been due simply to her lack of public appearance and album releases for a certain period. I've no idea if the rumor was true, but if not, it's interesting it arose from fan discourse, because a "creative illness" (tied to initiatory ideas) is a Trickster quality. Of course, that Kate Bush's voice itself is arguably the most unique of female singers in all of recorded music has a lot to do with her appeal, but perhaps that, along with the more larger and encompassing aspects of her Voice and persona, lie the reasons.